Shhhh…! 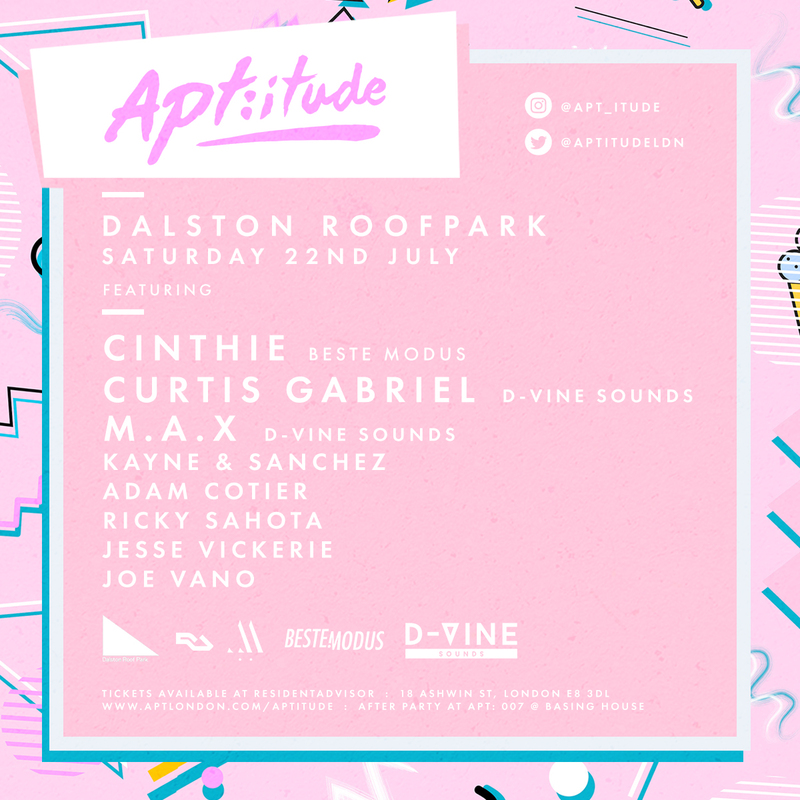 The Apt:itude collective are hosting a Secret Rooftop party on Saturday 22nd July.This summer the Apt:itude team will curate a hedonistic haven beneath the summer skies of old East London and a homage for all things HOUSE PARTY! This clandestine gathering of airheads & bimbettes will be hosted by a super stellar line-up of the finest house and disco honchos for a day & night of unashamed debauchery….what's your APTITUDE? Cinthie is a Berlin based DJ and producer, and the creative mind behind the Beste Modus and Unison Wax record labels. A well-known figure in the German capital's house scene. Along with Diego_Krause, Ed Herbst and stevn.aint.leavn, Cinthie represents the Beste Modus / Beste Freunde collective and we are extremely humbled to introduce her as our first guest for the day! Firm favourite, part of the DVINE Sounds family, M.A.X joins the Apt:itude collective. Breaking through as a House and Garage DJ on the infamous East London pirate radio circuit from the beginning of the millennium, M.A.X has witnessed the ever changing electronic music scene and evolved with it under various aliases. With tracks alongside Rudimental, Black Butter Records, Marc Kinchen and more, his sound couldn't be more fitting for our sky-high #rooftop event!